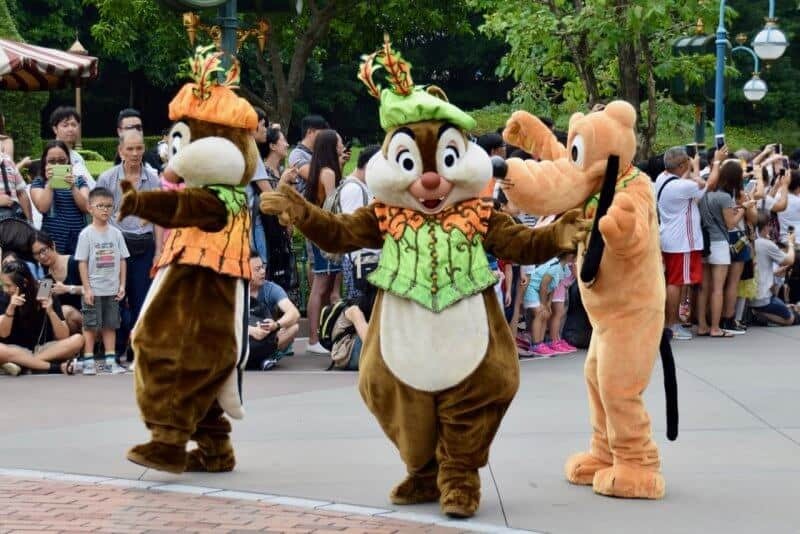 Hello, Fellow Explorers, and welcome to the second part of our Hong Kong Disneyland Halloween Trip Report! 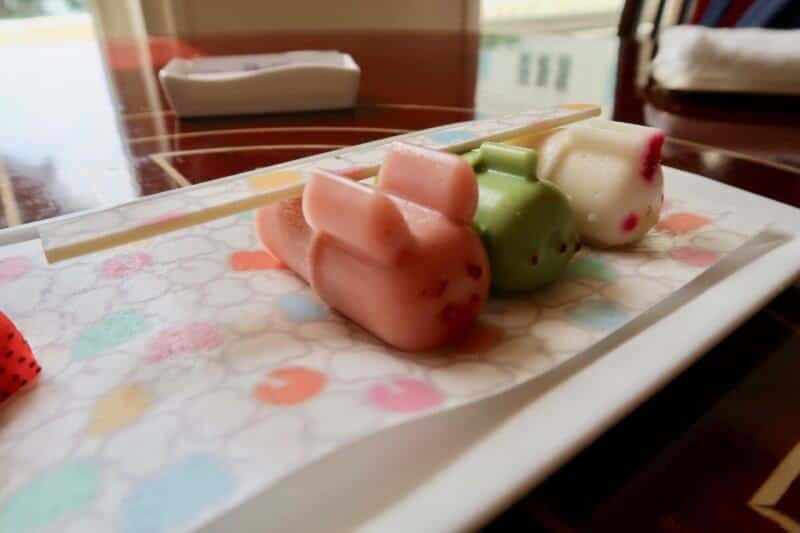 If you haven’t already, make sure to read part one, where I talk about our delays due to a typhoon and how easy it is to take a taxi to the resort. 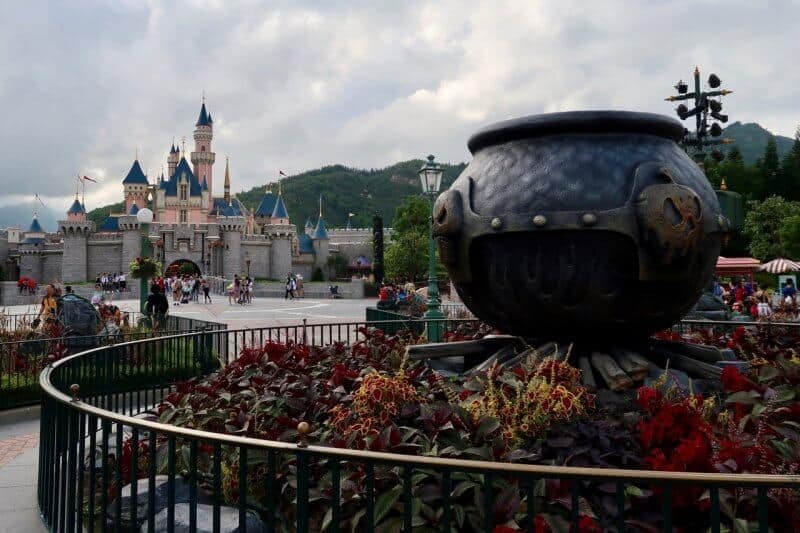 In this report, I cover our first full day in the park and switching from Disney’s Hollywood Hotel to Hong Kong Disneyland Hotel. 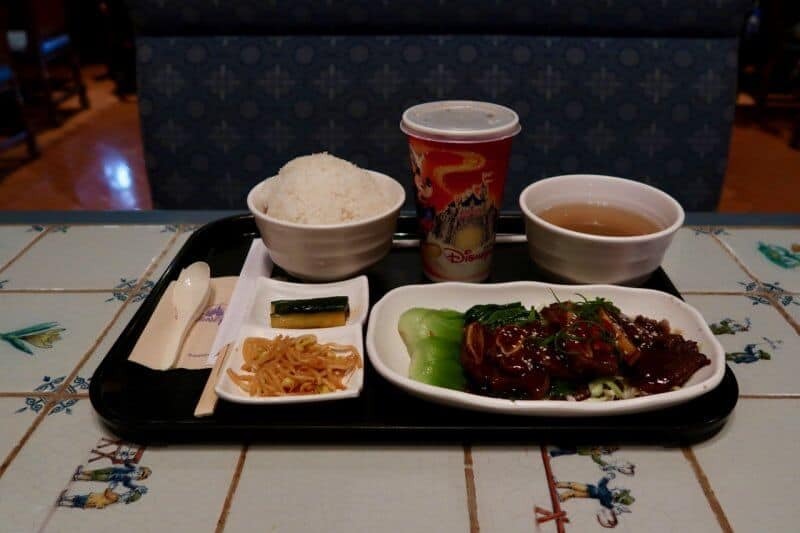 I’ll also give you a review of our lunch at the Crystal Lotus and sample the ever-so-popular Disney Dim Sum, upgrading my Park ticket to Magic Access (annual pass) and soaking in the Halloween atmosphere at the park. Alright, let’s jump right into it. Here’s part two. Enjoy! Our stay at the Disney Hollywood Hotel was only for a night, so we took our time to enjoy the hotel in the morning. I stayed at this hotel on our earlier trip and took video of the room. The park didn’t open until 10:30 and we had our reservation for the Dim Sum at the Crystal Lotus at 11:00. For breakfast, we made our way to Hollywood & Dine to grab something light. 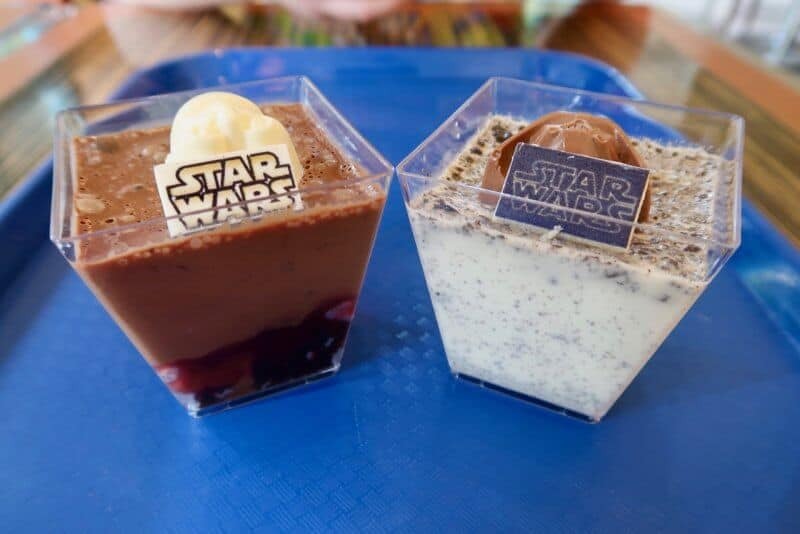 Bryson suggested the Star Wars puddings. In short, don’t bother with these. The exuberant amount of sugar and lack of flavour make for a unenjoyable breakfast/snack. They do look nice, but I suggest taking a photo of them in the display case and be on your merry way. After wandering around the hotel inside and out — the weather by this point reached 27C already — we checked out of the hotel and asked the front desk to have our bags transferred to the Hong Kong Disneyland Hotel. We then began our walk to our new hotel for our 11:00 reservation at the Crystal Lotus. It takes about 10 minutes to walk to the Disneyland Hotel from the Hollywood Hotel. 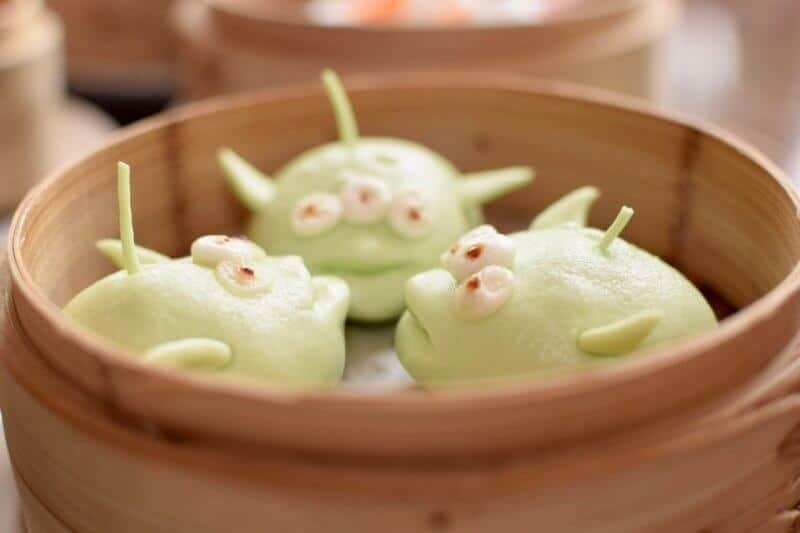 The Disney Dim Sum is a special menu offered to guests of the hotel, which you order up to 48 hours in advance. We made our reservation over the phone after our confirmed hotel booking. They email you the menu and ask you to select the dim sum you wish to order. In short, you cannot walk up and expect to order dim sum. All our dim sum had fantastic flavour and looked just as good. In addition to the dim sum, we ordered fried wagyu beef balls. Those were quite delicious, too. The dim sum is the only items on the menu you need to preorder. You may order off the normal menu at any time. The inside of the restaurant is beautiful, with “crystal” lotus lining the walls on the outside. The service was Disney quality. Overall, it’s a fantastic restaurant and you should add it to your list of places to eat. Before heading to the park, we did early check-in for our hotel room. They gave us the keys but informed us they only work after 15:00. I noticed Donald Duck in the hotel lobby taking photos with guests. 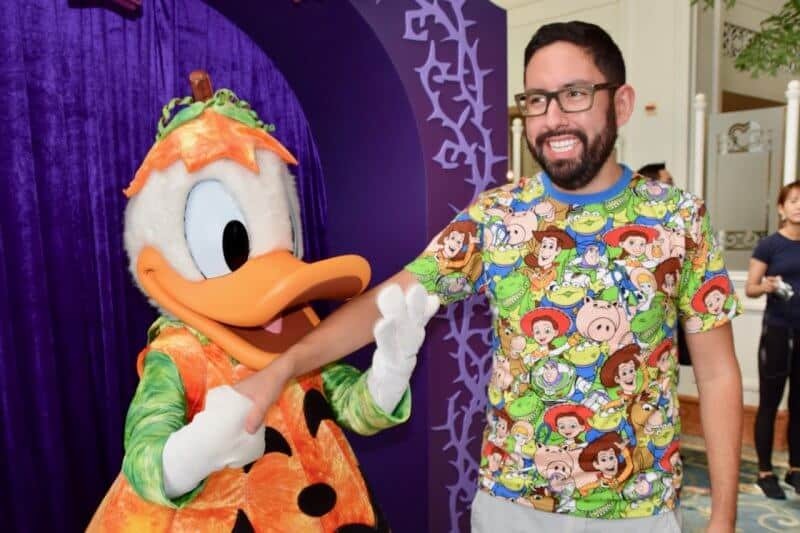 So we did what any normal person would do: went up there and let Donald Duck pretend to take a bite out of your arm. I asked Donald if I tasted like duck, which he wasn’t fond of. It was an honest question! After offending Donald Duck, we walked to the park from our hotel. It’s a peaceful 10-minute walk. While you can take the bus from the hotel, we thought walking was a nicer choice. At the time, they played various Halloween music along the walkway, which is great during the day, but haunting in the dead of night. We used the Hotel and Platinum Magic Access Guests security entrance, which got us in the park faster. Bryson already had his Platinum Magic Access and I had to exchange my discount ticket that I bought from Klook for a hard ticket. 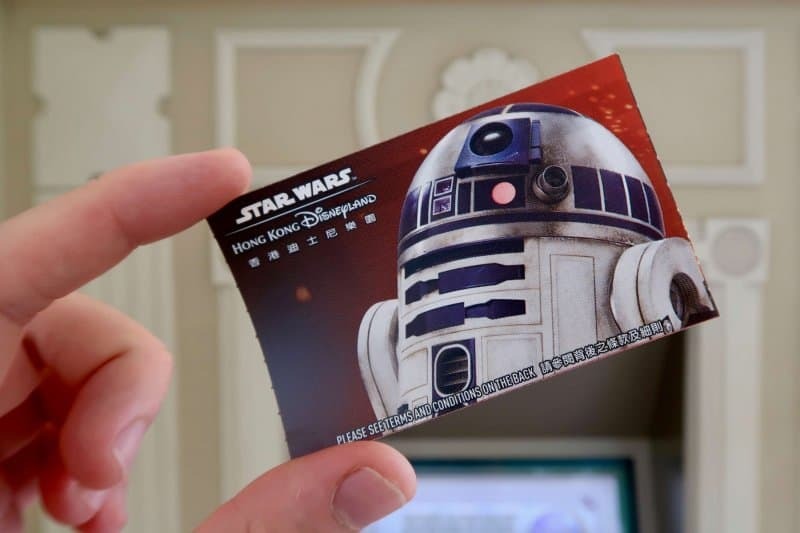 I took my voucher to the Auto Magic machine and voila, got myself an R2-D2 printed Park ticket. 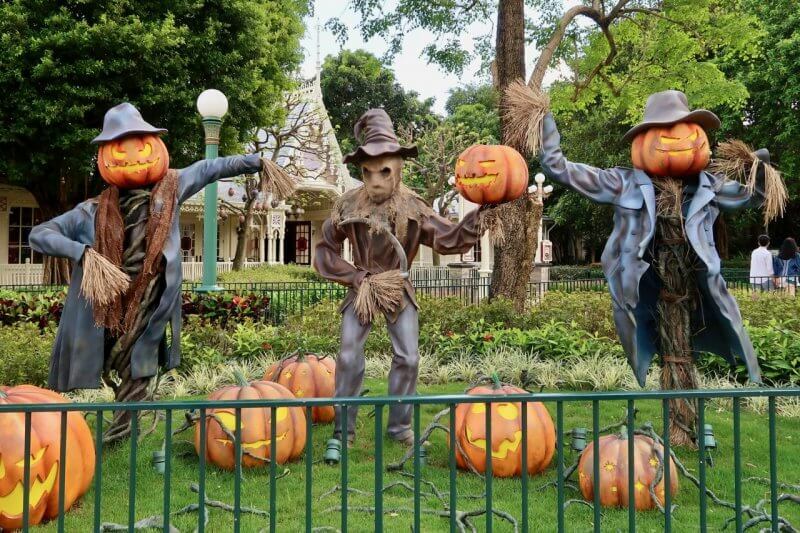 For more, read our full guide to park tickets at Hong Kong Disneyland. Now, before anything else, I needed to upgrade my park ticket to a Gold Magic Access Pass. The process is painless and took about 10 minutes total. Fill out the application form, show them your ticket, take your photo, and pay. They deduct the amount of the ticket you’re upgrading off the cost of your Magic Access. Since Bryson is a Platinum Magic Access Member, he asked for his birthday package (October is his birth month), which comes in a beautiful folder and has various coupons. Let’s take a moment to admire the decorations on Main Street U.S.A. 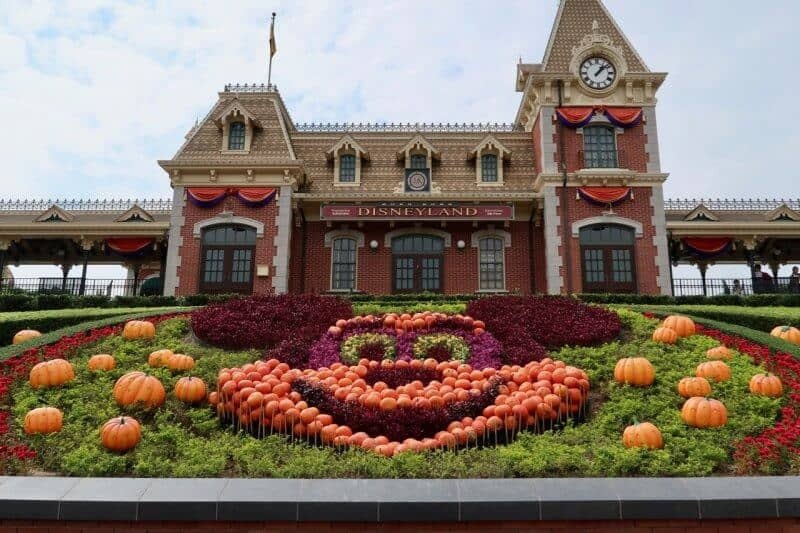 The entrance to the park had a beautiful display with real pumpkins and smoke surrounding the Mickey floral arrangement. Atop the arches, before you enter Main Street U.S.A., are banners with changing pictures. At the beginning of Main Street, there are a large Mickey Pumpkin and banners on the light poles. Along Main Street — much like the walkway from the hotel — you’ll hear a variety of music ranging from Nightmare Before Christmas to Pirates of the Caribbean. It’s a bit jarring to have that playing on Main Street, I thought. Around the rest of the park are light decorations. All the decorations are naturally best in the evening while they are lit up. Alright, now back to our day at the park. By the time we finished with my Magic Access and Bryson’s birthday package, we decided to take advantage of his Platinum status and stand in the “Platinum Members Only” line for The Festival of the Lion King. This line allows us to get into the show about 5-10 minutes before showtime, which means you get to choose the best seats. We followed what the crowd did and sat in the 2nd row of the section just to the right of the entrance. The first row had filled up fast. 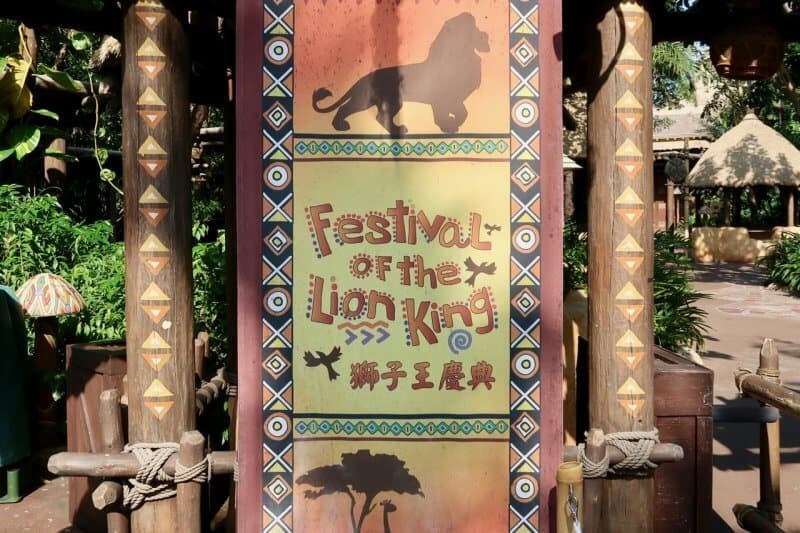 Hong Kong Disneyland’s version is a simplified version of The Lion King story. 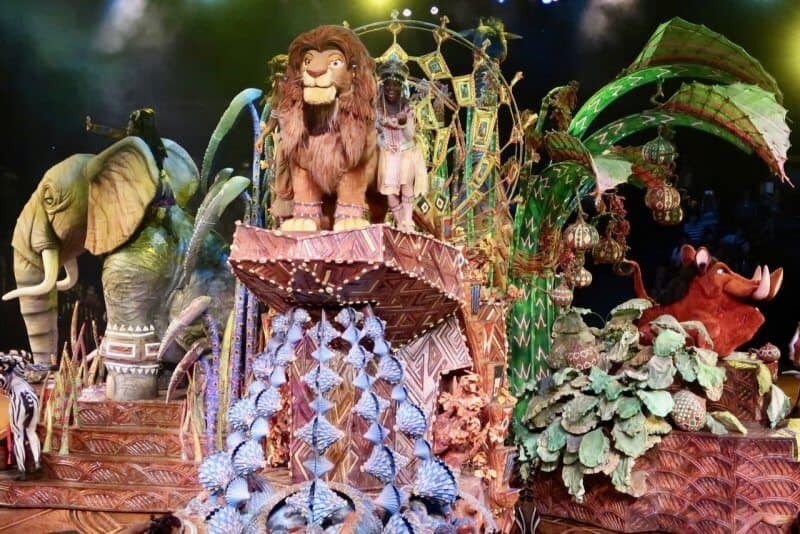 The show is a retelling of Simba’s life by Rafiki — who is female, similar to the Broadway version — done mostly in English. There are two monkeys who translate portions of the show into Cantonese, which is well-executed and cute. Subtitles in Simplified Chinese are on small screens above the seating area. If you are sitting close enough to the front row, you won’t see them. Overall, the show is well worth your time and you should add it to your “must watch” list. We did see the show a couple of times over our visit and it was never full, so there is little worry about that — unlike Mickey and the Wondrous Book, which we talk about in our next part of the trip report. Just after lunch time we rode our first attractions of the trip. Grizzly Gulch Runaway Mine Car Extravaganza — wait, I mean “Big Grizzly Mountain Runaway Mine Cars.” I can never remember the name. It’s one of my favourite attractions there, but my love of Mystic Manor and its adorable mascot Albert is stronger. Grizzly had a wait time of 5-minutes while Mystic Manor had a 15-minute wait, which is unheard of! 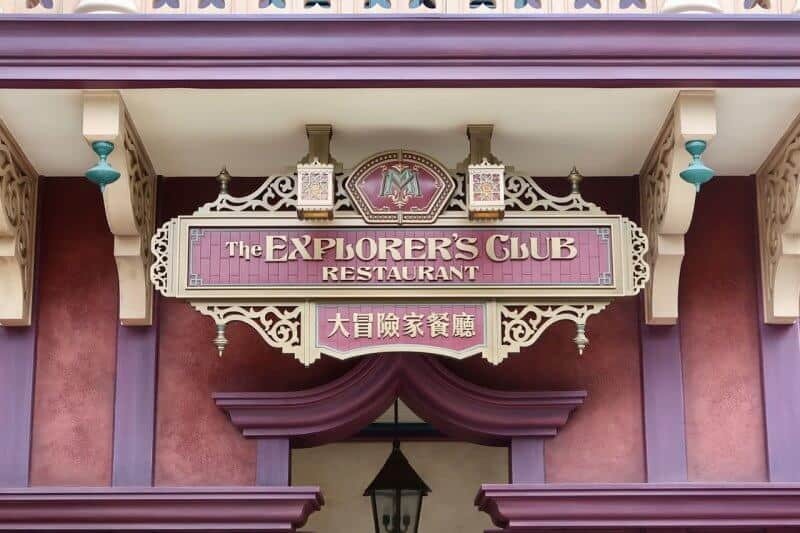 Our late lunch was at the Explorer’s Club, which is part of Mystic Manor and has some of the best restaurant theming in the park. I had the Korean BBQ Pork, while Bryson opted for the curry. There are multiple rooms that you can sit in, and we chose the Russian Room, only because it was the least crowded. There are various choices of cuisine offered here, so it’s easy to find something for everyone. 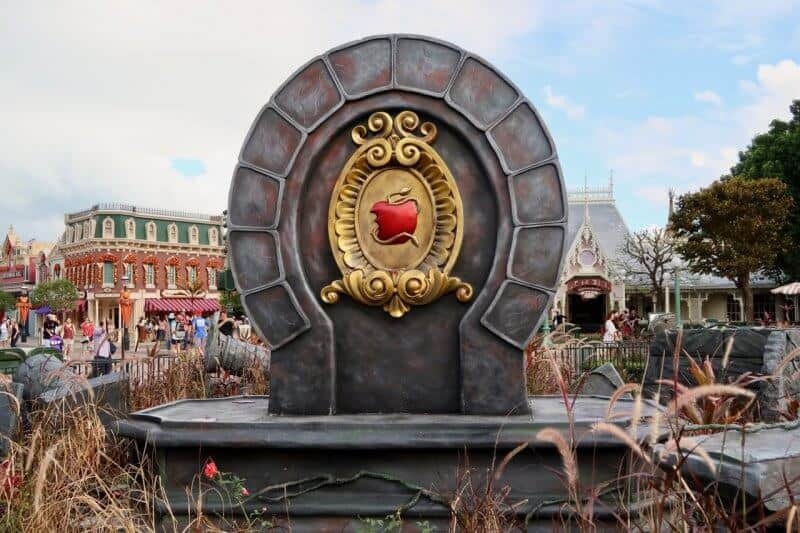 Riding an attraction after eating is not a good idea, so we decided on securing a spot for Mickey’s Halloween Cavalcade — their Halloween parade — just to the right of Sleeping Beauty Castle (which, if you haven’t read already, the castle will be undergoing a transformation in the near future). We had a great viewing point where the performance comes from Fantasyland and turns into the hub area, which made for the perfect angle for photo and video. 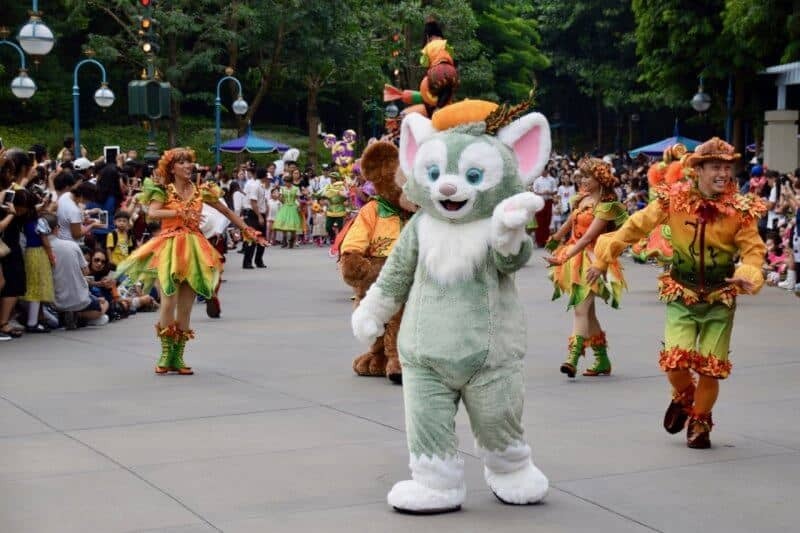 The show itself is short, but the music is catchy and the costumes are quite adorable — and you can find them in the gift shop! Just a bit of a warning: the music will get stuck in your head. Before we got to the Nightmare Experiment, we had to ride the Jungle Cruise, which is one of Bryson’s favourites (after Mystic Manor, of course). If you haven’t ridden it, you need to. I won’t spoil anything, but you won’t be disappointed. They have a line for English speakers and the skipper does the show in English. 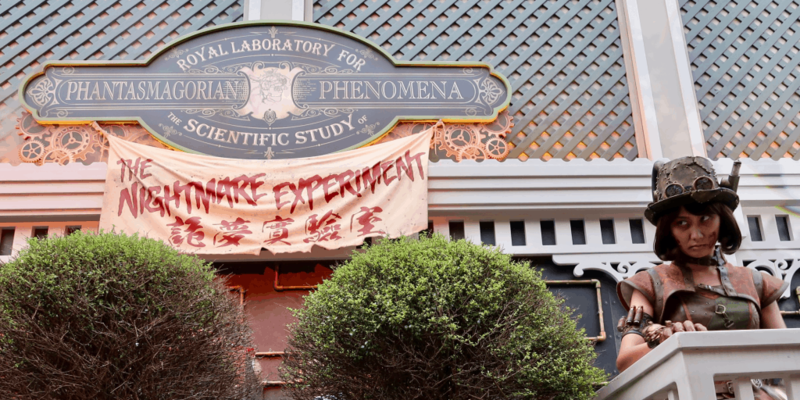 The Nightmare Experiment is a walkthrough experience, which consists of a laboratory, tunnel, and labyrinth where you are guided by “The Professor” who tries to help you escape the nightmare. 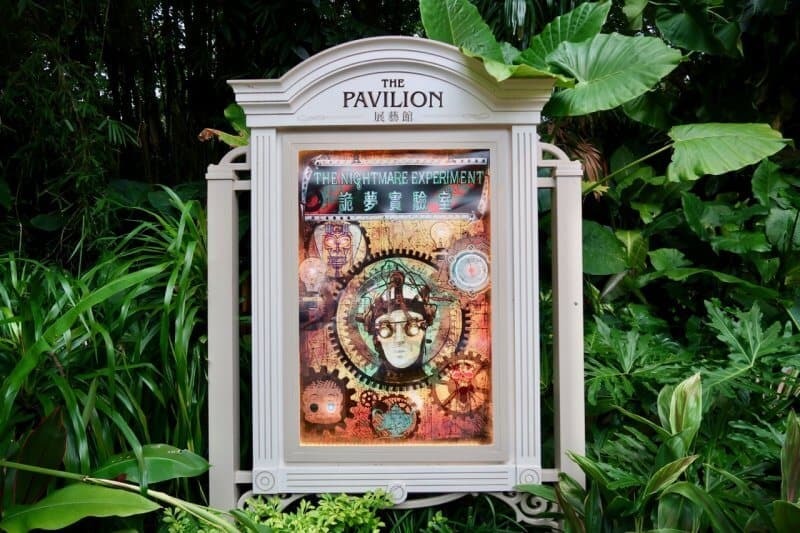 The “experiment” features themes from The Princess & The Frog, Pirates of the Caribbean, Toy Story, and Alice in Wonderland. 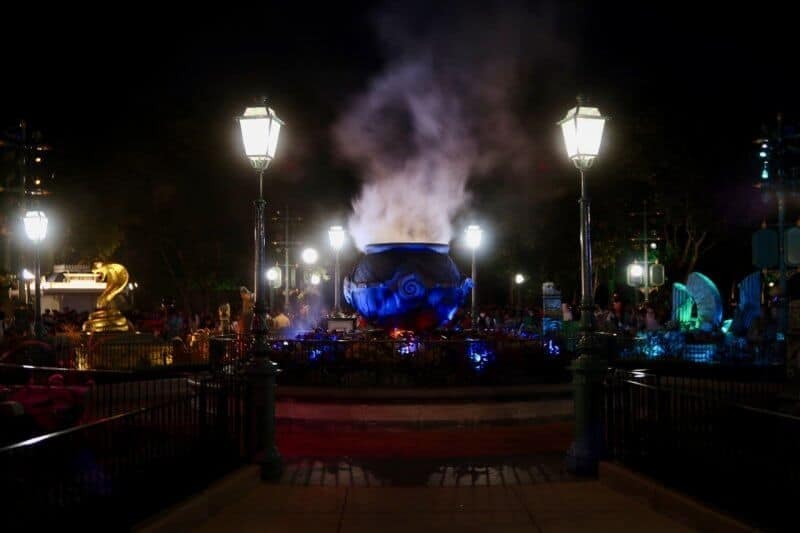 This experience is much darker compared to other Halloween offerings in the Disney Parks. 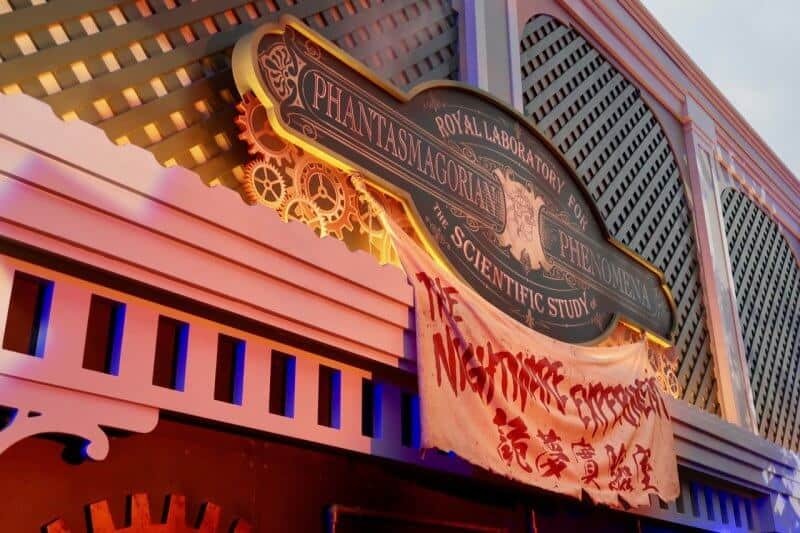 While “The Nightmare Experiment” is not on the level of Halloween Horror Nights at Universal Studios, it has its moments where things jump out at you and scare you. 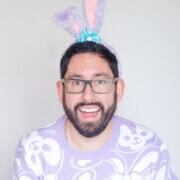 This is not for small children. I found myself jumping a few times. Here’s a full video of the experience. 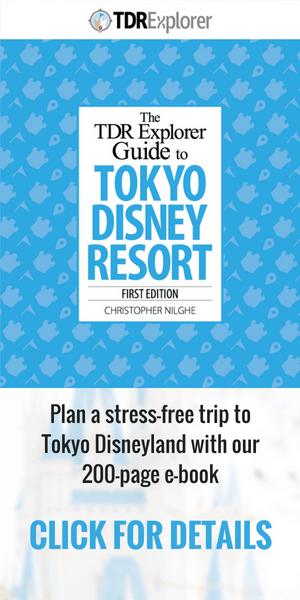 Listen to me retell the experience in our podcast TDR Now, starting at the 47-minute mark. 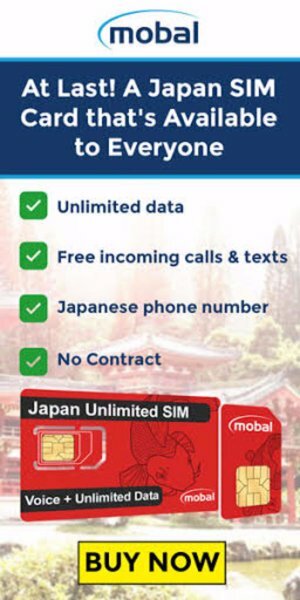 The only downside to this is all the dialogue is in Cantonese with no English, so a lot of the story was lost on me as we went through the experience. 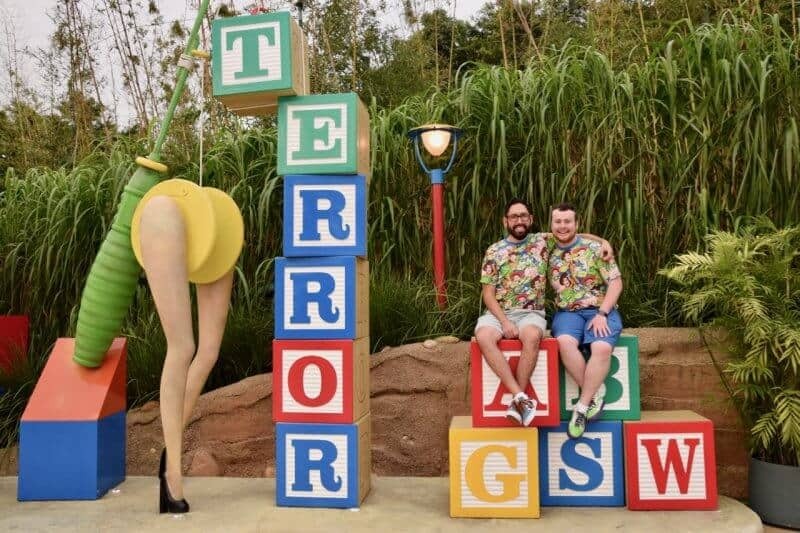 To cleanse our souls and to document our fantastic matching outfits, we went to Toy Story Land to get our photo with Woody and have ourselves a photo shoot. 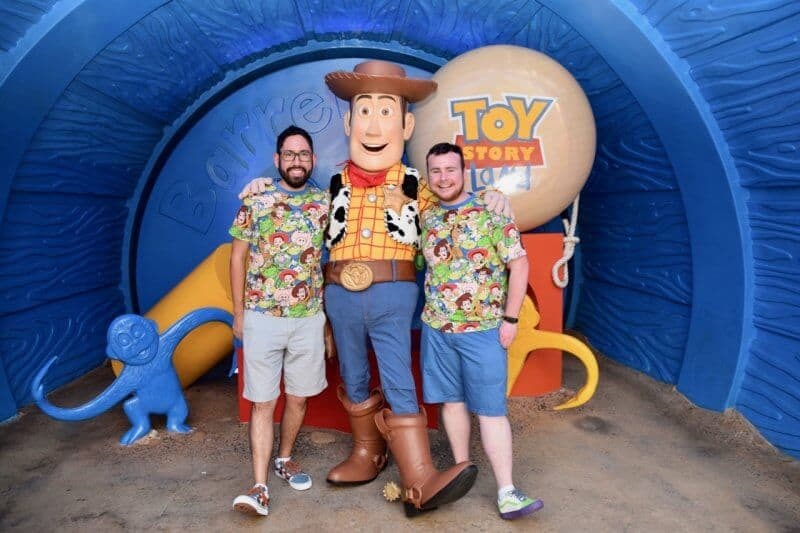 Our Toy Story shirts from Tokyo Disneyland and Toy Story Vans were a hit and had a few people comment and want their photos with us. We got ourselves a spot for Villain’s Night Out — the nighttime parade — in the hub area. This was my least favourite Halloween show of them all. The music was repetitive and, dare I say, annoying. The show itself had an odd arrangement as well. The villains come down Main Street U.S.A. (which has projection mapping along the street, which is one the only good part), and the “parade” splits as they use both sides of the hub and converge in front of the castle. Jafar and the Evil Queen are poking out of cone-shaped floats, which are a bit odd. The other villains, such as Jack Skellington and the Queen of Hearts, are free-roaming down the street. There are other performers in the middle of the hub, also. While they have well-done costumes, the purpose of them was lost on me. They consisted of large black birds on stilts and women in golden dresses dancing about. The entire show is in Cantonese during the speaking portions, so perhaps the “story” was lost on me. 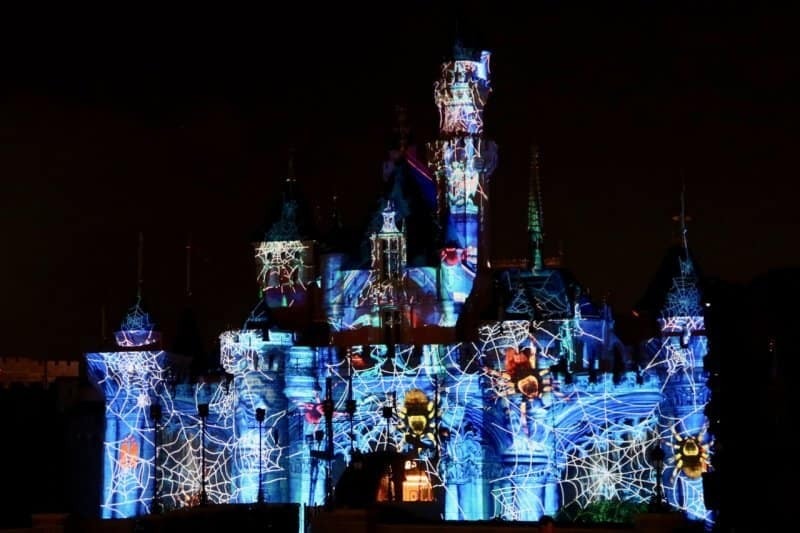 Once the performances get to the front of the castle, there are various projections of spiders, snakes, etc, on the castle (which stay on after the show). Overall, the show was a mess, and I am not entirely sure what I saw. Sad to say, I was rather disappointed with the show. Since the show moves around a lot, so does the crowd. So you end up shuffling during the show — unless you are stationed right at the front of the castle. 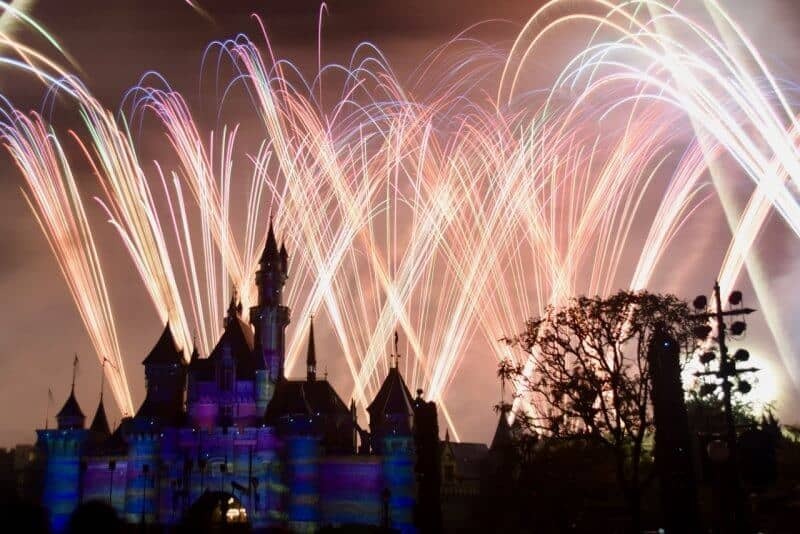 Once the show was over, we held our spot and enjoyed “Disney In The Stars” fireworks, which I always love, and they made up for the strange show before them. After the show, it was time for our reservation at the Enchanted Garden Buffet back at the Hong Kong Disneyland Hotel. 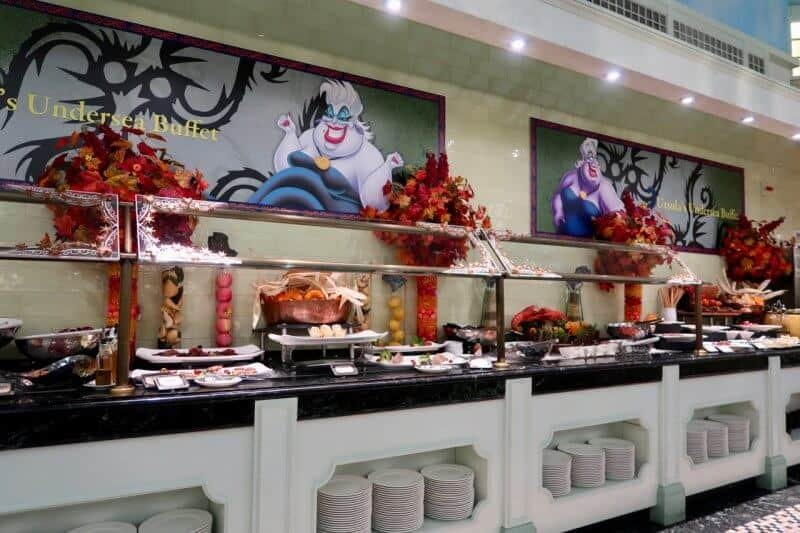 Enchanted Garden buffet is a character buffet with Mickey, Minnie, and Chip ’n’ Dale. They wore their Halloween outfits, which made for fantastic photo ops. 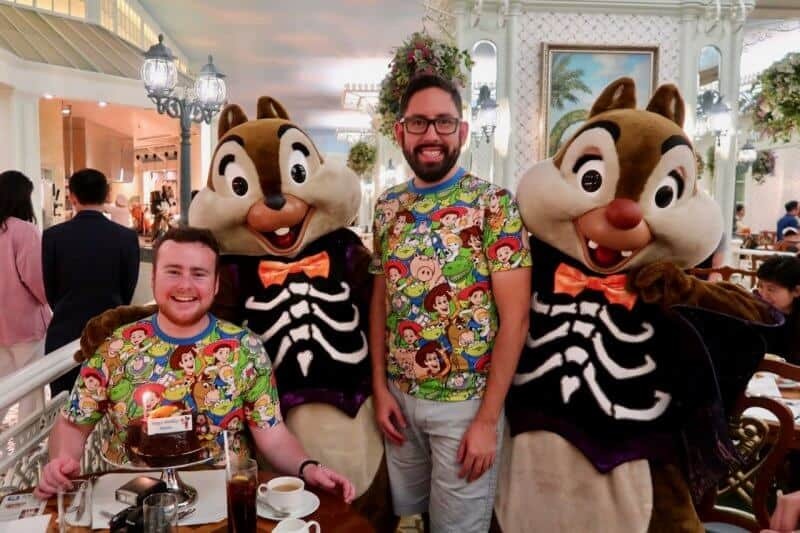 The PhotoPass Cast Members capture all those special moments during your meal — even the moments where Chip ’n’ Dale interrupt your birthday cake dessert. 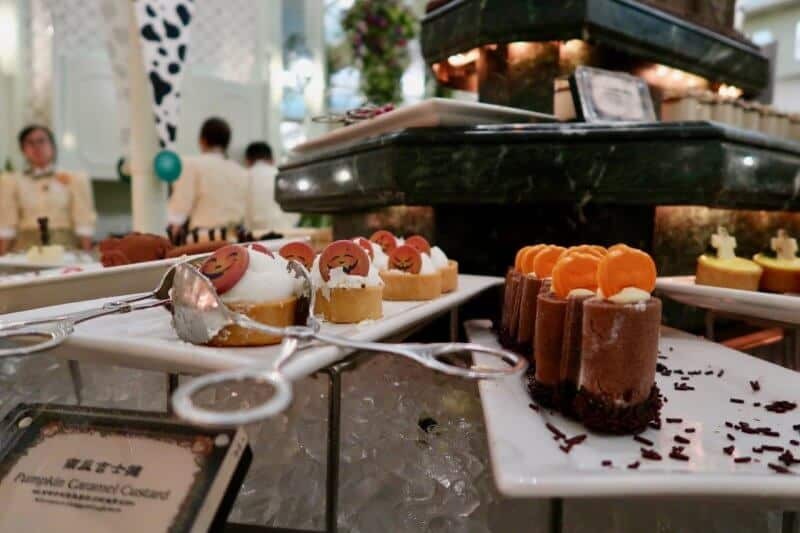 The food offerings at the buffet are vast and there’s something for everyone, from hamburgers and fries to seafood to Italian food. You’ll get your money’s worth. For Halloween, the desserts were themed appropriately. The price of an adult is around HK$500 (~$64USD), which does make for an expensive meal. We used the birthday coupon, where if you buy one full adult meal, you get another free. 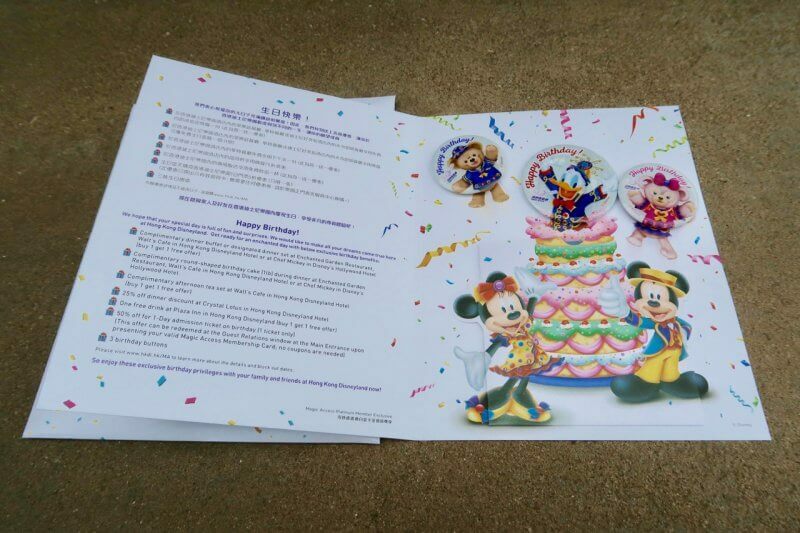 On top of that, we also used the coupon for a free birthday cake (which we paid for the upgrade to the Mickey-shaped cake). The decor inside is beautiful and matches the hotel perfectly. The character interactions are always a delight, and the variety of food and quality are top-notch. We also randomly met fans of our website who were visiting from Japan! After filling our stomachs to the brim with chocolate cake, coffee, soda, spaghetti, and seafood — well, I ate seafood while Bryson didn’t — it was time to turn in for the night. We rolled up to our room and allowed our stomachs to digest. 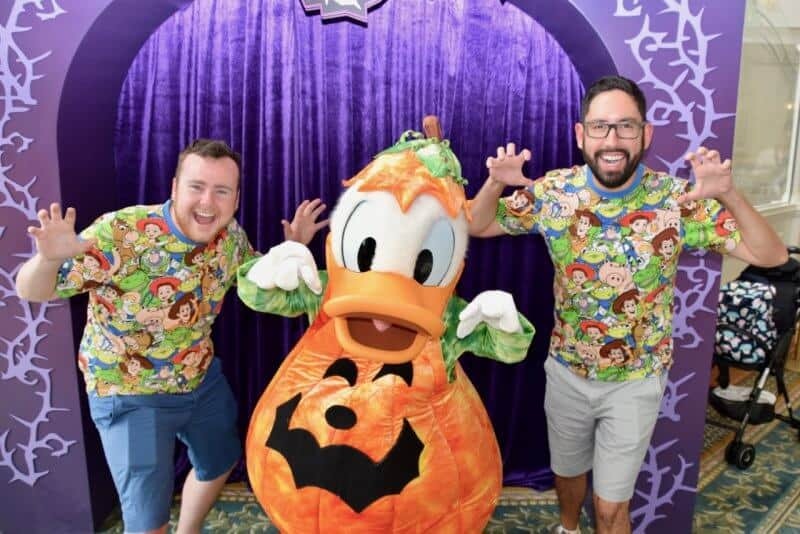 In the next edition of our Hong Kong Disneyland Halloween Trip Report Extravaganza (I wanted to make it as long as I could), I finally watch Mickey and the Wondrous Book, and we treat our taste buds to the Mango Dole Whip! BUT DO YOU MEET GELATONI????????? ?